Luc Besson is not my vibe generally but I'm not so turned off him that I can't enjoy his films if they hit something for me. I was pretty much on board for Valerian and the City of a Thousand Planets in it's first half hour, but when I say pretty much there were some things bugging me which I couldn't put my finger on right away. The film is straight up, unabashedly proud B-movie mania. The dialogue is intentionally clunky, the costumes delightfully cheeky, and Besson's throw logic out the window style is on full display. It is immersive in the world, not universe, it is creating. It's got all the Barbarella vibes of mid-20th century sci-fi and it enjoys it. It's got it's white savior colonialist critique going strong, and the visuals are out of this world. I think the failings for me came down mostly to casting. I love Dane DeHaan and I think he's still waiting for his big break. But he is so wrong cast as Valerian. His demon child, nerd boy energy just doesn't play into the roguish hero he's supposed to be playing And Cara Delevingne (why is she an actress?) with her Avril Lavigne Mean Girls sneer has no where near the gravitas to pull of the Leia inspiring character Laureline. And the two have absolutely zero chemistry. After the first half hour it came to me that I wasn't buying into their characters at all, the two leads. Wooden Delevingne and miscast DeHaan were distracting me with their flat falling banter all the way through and it completely took me out of the story. There are other bad casting choices too. Ethan Hawke's sleezy cameo felt disjointed. Casting Rihanna as an abused showgirl who says "I deserved that" after being hit felt completely wrong as well. 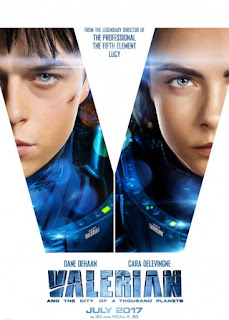 Valerian and the City of a Thousand Planets feels like the kind of film which spent its whole wad on how it looks and did little to fill it with the kind of interesting folks needed to make this glorious universe feel lived in, make us want to be there. It's a bit shiny but hollow. It's not a terrible ride and I wasn't bored despite the long running time but I also wasn't invested. Valerian feels like a missed opportunity. There could have been something amazing here and instead there just isn't.